2011 Club Nintendo Rewards Announced. Prepared to be severely disappointed. 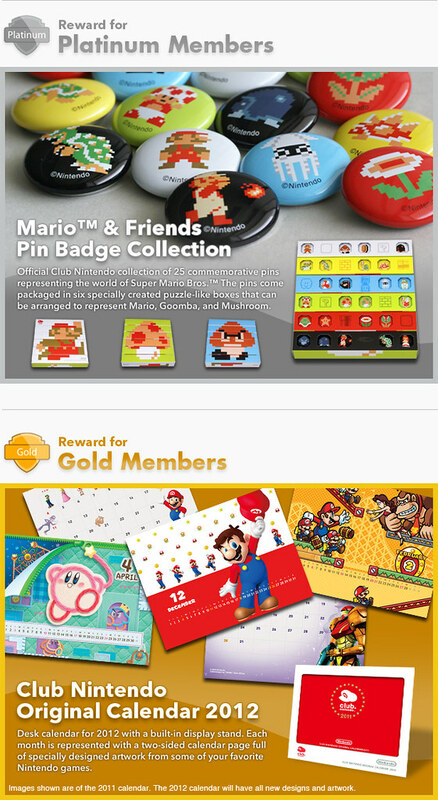 Nintendo of America has just announced their Platinum and Gold Rewards for Club Nintendo Members for the year of 2011. A lot of people were expecting some cool Zelda figure or maybe a game. Instead we get pins. Yes, you read that right, pins. I'm very disappointed by this. In my opinion, pins should be a Purchasable Reward not the Grand Prize. What do you think of these prizes? Sound of in the comments section below. It's more pins than I make at my job! I don't know if I will keep this sealed or open it. It'll be tempting to sport them on occasion. so can NOA be sent a message if a ton of people turned down these crummy prizes? This reward of sorts is certainly beyond lackluster. That's not to say I expected anything super grand, but I had hoped for something a little more interesting and perhaps worth oohing and aahing over. I've never really understood the point of pins. Maybe if I were in grade school and wanted something nifty to adorn my backpack, but now I haven't much use for them. Fangamer includes pins with every order, so I have quite a number of them that just sit around. Surely for them to include them with every order, and make some hard to get or random, there must be some kind of market out there for pins. The only use I can see for them now would be if I were to wear a shirt with a tacky logo on the chest, I could see a pin being rather handy to cover such an atrocity up. Pins or something else entirely, at least we are getting something for spending a few moments typing in some codes. Still, one has to wonder what goodies could have been rewarded to Nintendo's most loyal club members. It shall be adequate future eBay fodder, I suppose. That's a little pricy though, I could probably make something similar. Man, now I'm pissed I didn't make it to Platinum this year! That's the best free reward I've ever seen! DANG IT. It would have gone beautifully next to my Disney Pin collection. And 25 of them? That's freaking awesome. I'd have expected like 5 maybe. Sure as heck beats the stupid Mario Hat I got whatever years ago. That thing didn't even fit and I'd certainly never wear it outside if it did. Check out someplace like Michaels (or most craft stores). They have picture boxes that are perfect for this sort of thing. That's what I have my Disney Pins in, though pretty soon I'm going to need a larger one. But when you hang it on the wall, it's a very nice piece of art. @-JKR- can you take a picture of your display cases for us? Since we are getting these pins, we might as well make the best use of them. Fangamer is Starmen.net's online shop for all things EarthBound. They have expanded of late and now offer Metroid, Chrono Trigger, Mega Man, and Mario wares. Their new Warp Zone Combo is chock full of rather amazing fan made Mario goodies. They even have a handmade ♥♪! ?/Geno figurine available for preorder that is guaranteed to sell out fast. Anyway, they package pins in with every order, sometimes just one, sometimes three with a bonus pin for collectors. It's a great shop with awesome folks heading it up. Wow, that's cool! Never heard of the site before, I'll have to order something. That's a very cool site. I really like their shirts. Who knows, maybe this Club Nintendo Prize and Fangamer will turn me into a pin collector. How much is shipping for Fangamer products? I don't see it on the website. Rewards are shipping. Don't everyone get too excited at once. Yeah, received the e-mail about them preparing to ship. I finished a bunch of surveys (the ones for the NES Ambassador games expire in a month, people!) and ordered Ball. Anyone else got that? Satisfied with your choice? This is why I never bother registering my games with Nintendo. What's the point? The calendar would be OK to have I guess but it's not worth the trouble. I got it but I'm not opening it. I don't see why I should since it's not like it's fun... but I just wanted to use my coins. I ordered Ball a few months ago. Unlike Vof, I did open mine and played around with it for a bit. It's fun for about 10 minutes, but still cool to have. Besides, what else is there really to order from Club Nintendo? Gotta spend those coins on something!